Deliver your digital coupon campaign with a simple scan and boost your sales. 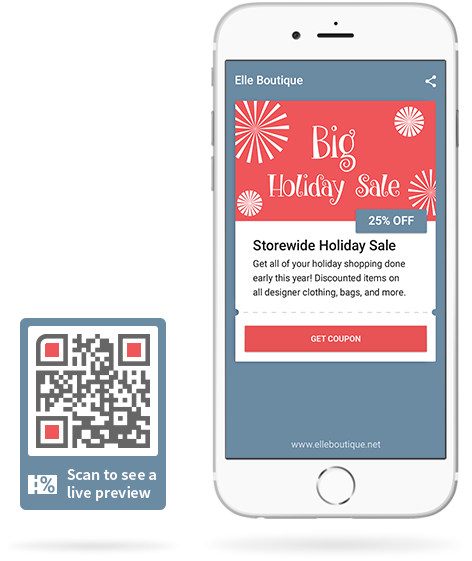 Go mobile on your coupon marketing campaigns and make it simple for customers to redeem your coupon with a single scan of your QR Code. Customize your own coupon page where customers can check out your promotion and get all the details directly on their smartphone or tablet. Customers will love that they can quickly save your coupon, email it to themselves, and instantly share it with friends on social media or anywhere online. Use the Coupon QR Code on your next sales campaign to get more customers. When I introduced my Coupon QR Code to the office, we were amazed in no time. Customization let us capture our corporate look, as if we developed the page by ourselves. Find out everything you need to know about the Coupon Code from how to create it to advertising your QR Code and short URL. Need some inspiration? Check out these clever ways to advertise your Coupon QR Code. Whether you're running a restaurant discount program , promoting a new store, or trying to get people to sign up for a gym membership, a digital coupon marketing campaign can be an effective way to attract customers. The way you design and distribute coupons can influence how effective the campaign will be, and adding a Coupon QR Code to your promotional materials can be a smart move. Let's find out how these simple codes can turn your coupon cards or flyers into a marketing goldmine. Whether you intend to distribute store coupon materials or restaurant discount coupons, hooking them up to a digital marketing campaign makes perfect sense. Basic printed materials are a good starting point, but they aren't connected to your website, ticket booking sites, or social media channels. So when customers receive these coupon cards, it's not always easy to put them into action. If you add a Coupon QR Code, this problem becomes much easier to solve. Customers can simply scan the coupon and be directed to a dedicated page for your marketing campaign. So, if you're promoting a sale via a store coupon, customers can instantly find out what's on offer. Or if you are promoting a gym, they can head straight to a signup page where their discount will be applied. In a world where most of your customers probably use smartphones, these codes can be an elegantly simple way to streamline your sales funnel. Another handy use for a QR code-based digital coupon marketing campaign is as a means of distributing discounts. Instead of paying to hand out leaflets, or mailing out menus to households in your area, it's more efficient to enable customers to download discount coupons from posters or other promotional materials. For instance, if you want to connect customers with a restaurant discount, and you're running advertisements in local magazines or newspapers, you might want to add a Coupon QR Code to the ad. When customers see the advertisement, like what they read, and notice that there's a discount on offer, they can scan the code, download the coupon, and make a booking, all at the same time. It's all about connecting the dots in your digital coupon marketing campaign. It doesn't cost much to launch a QR code campaign for specific discounts, but for a small expense, you can make it dramatically easier for customers to access your services. From that perspective, it's a no-brainer. However, digital coupon marketing campaigns aren't just about distributing coupons or streamlining ticketing or booking processes. They can also be used to gather information about your demographic, which then feeds into future marketing campaigns. The way this works is very simple. When people receive your store coupon and scan the code, they can be taken to a dedicated page. Before clicking through to access the discount, they can be asked for a few pieces of information such as their name, e-mail address, or phone number. Generally, if customers are excited by a restaurant discount or store promotion, they won't mind entering a few pieces of basic information. And that information can be used to contact them in the future when new promotions arise. How to create online coupon marketing campaigns? Discount and coupon marketing can have huge benefits for almost any business. And when you add QR codes into the mix, you can make your discounts even more productive. So how do you actually go about setting up a campaign which uses these codes as effectively as possible? At QR Code Generator, we've come up with an app which makes it easy to create online coupon pages. When you add codes to a store coupon or advertisement, customers will be channeled to special web sites that are designed purely for your campaign. You can create online coupon materials with ease, allowing customers to redeem them online or in bricks and mortar stores. The coupons can be saved for later or shared with friends at the click of a button, and they are optimized for viewing on virtually any mobile device or computer. So, if you have a discount to deliver, create online coupon campaigns which harness the power of the Coupon QR Code. These simple codes could be the key ingredient of your coupon marketing efforts.